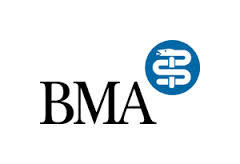 Euthanasia Prevention Coalition Euthanasia Prevention Coalition: British Medical Association (BMA) members reject neutrality on assisted suicide. Ultimately, much rested on the meaning of 'neutrality'. 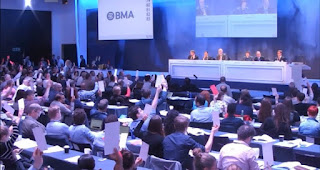 Advocates said that by not taking a stance, the BMA could speak on the basis of the evidence while not excluding any members who are in favour. Quite apart from the fact that policy in opposition to assisted suicide is evidence-based, Baroness Hollins rightly commented that the BMA would never have any policies if all sides were always given equal weight. Dr Kevin O'Kane asked: why would the BMA go neutral on whether doctors can help kill their patients? He described neutrality as 'facilitative'; Dr Pickering said it wasn't about choosing neutrality, but being neutralised and would be read as dropping opposition; and Baroness Finlay said it would be perceived as doctors actively changing their minds on assisted suicide. Dr Mowat was clearest of all though: a move to medical neutrality would indicate acceptance or indifference to assisted suicide, and where doctors have surrendered their opposition abroad, it removed a major obstacle to legislation. A medical student who spoke towards the end of the debate said that she entered medicine to care for and value the lives of patients, not to arbitrarily agree that some lives are not worth living. 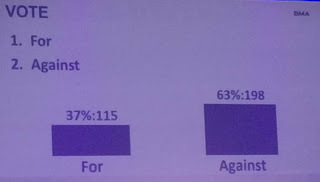 Judging by the scale of the ARM's rejection of neutrality, she spoke for the majority - and we are glad. Once again, doctors - including those working most closely with dying people - have reflected on their experience and the reasons they dedicate their lives to care, healing and support, and have once again told their chief representative body to oppose uncontrollable, unethical and unnecessary legal change in their name.